Okay, Tomahawk has been around since the seventies, so it’s not exactly a maiden voyage. But it was for us! On Monday, we got our informal sailing teacher Steve to help us haul up the anchor, get the engine going, and go for a little ride. 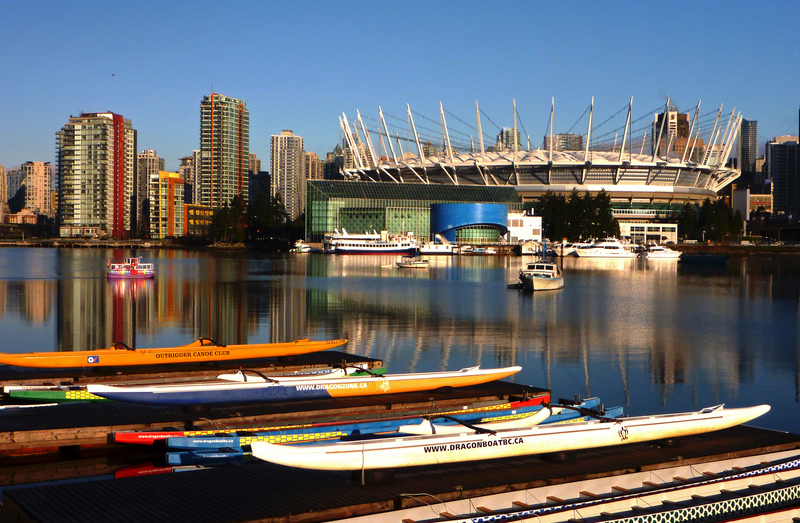 Our False Creek permit expires tomorrow, so we had to find a new place to keep the boat until we can get a new one. Jason and I got to the boat at noon and cleaned off some more bird poop. Unfortunately, it hadn’t rained enough to have any cleansing impact on the sail cover. I did the dirty work this time, since he did it last time. We sacrificed one of the SOS pads left on the boat by Danny. We were contemplating taking the sail cover home to stick in the wash, but we’ll have to work out the logistics of that. Don’t really want to leave the sail uncovered, especially if the diarrhea bird decides to come back! Anyway, Steve checked our oil and spark plugs, which all looked fine. The oil wasn’t completely black, he said, which means it needs to be changed soon. We’ll keep that in mind. I haven’t change oil myself, but I helped someone do it for their car once. So I know it’s a pretty simple task, really. Steve took us to Granville Island, where we loaded up our jerry cans with gas. It cost less than $40 and we expect that to last us several months, especially if we use the boat as little as we are now. With the weather getting worse, that seems pretty likely. After gassing up, we headed to our new anchorage, which is much less sheltered than False Creek. Steve refers to it as the Pirate Bay, so we’ll call it that. A few other boats were anchored in the area and we had to squeeze in between them. Our anchor weighs a ton, probably way more than necessary to hold the boat in place, which is good. Instead of the recommended 5:1 ratio of rode to water depth, we ended up with about 2.5:1 to keep our swing radius to a minimum (as explained in this post on anchoring technique). I’m hoping it’s fine, but Steve texted me today that we should expect a small craft warning for Saturday. 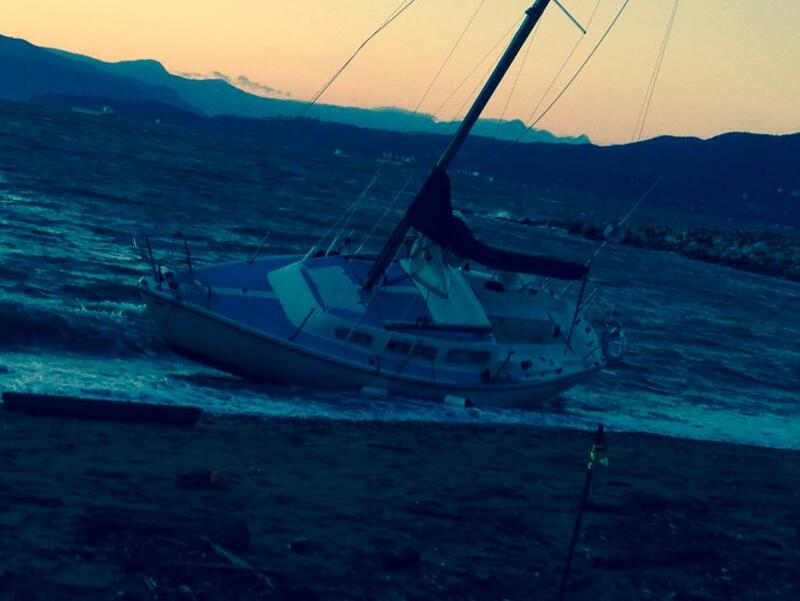 That means high winds potentially strong enough to push Tomahawk onto the beach or into another boat. We don’t want either scenario. If we do have to move the boat, we have a problem arising from our ongoing work scheduling conflict. Jason works days and times when I don’t and vice versa. On both Friday and Saturday, for example, I work 10 to 6 and he works 4 to midnight. So yeah. We’ll see. Maybe Steve will move it with one of us as crew. Meanwhile, we have yet to put up the sails. 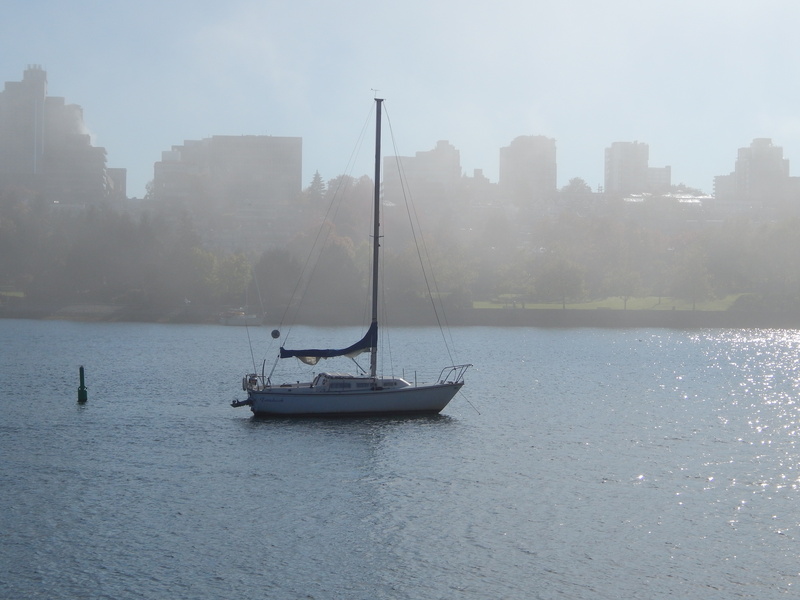 Our trip from False Creek to the Pirate Bay was done entirely under engine power. That’s because you’re not allowed to put up your sails in the creek, from what I understand. Hopefully next time, we can finally catch some wind. For the past few days, my sailing obsession has shifted from toilets to dropping anchor. This skill will be vital if we ever want to move the boat from its current location – which we have to do by October 30th anyway. Luckily, the internet knows everything. However, reading about it is never the same as doing it. I could read about building a spacecraft, but that doesn’t mean I can then go out and make one. Then again, anchoring doesn’t seem overly complicated. From what I understand, the most important things to know are what kind of bottom you are anchoring in (e.g. soft mud, grass, rock) and how much swing radius you need. Swing radius refers to a circle around where your anchor is dropped, where your boat could shift to if the wind or current changes. As you let out more rode, your radius increases. If you’re the only one in the anchorage, you don’t need to worry too much, but if there are other boats around, you have to keep an eye out for their swing radius and make sure they don’t overlap too much. Not all boats move the same way, either. Powerboats, monohull sailboats, and multihulls like catamarans and trimarans behave differently in the wind and current. So it’s best to anchor among boats that are like yours. I guess that means we need to stick with smaller monohulls. So you pick your anchoring spot, start lowering your anchor off the bow (not all at once or the rope will tangle), and slowly back up your boat. You should point into the wind or current, whichever is stronger, and let your craft drift backwards. If necessary, a little engine power can help set the anchor properly. In softer bottoms, you also need to give it some time to settle properly. Of course, there are a million variations on this and so much depends on the boat and the anchorage, as well as the anchor’s weight and other properties. In some cases, you might even tie the stern (back) of the boat to a tree on land, to keep it from swinging around too much. Or, in some areas, you can forget the anchor and simply hook up to a mooring buoy, as shown in this Sailing Magazine video. We’ll have to check out the nautical charts on the boat to start learning about local bottom features around here. P.S. Happy Thanksgiving to my Canadian friends.